Under the pressure of housing shortages and speculation, more and more cities want to designate “urban development areas” in accordance with sections 165ff of the Building Code. The aim is not only to create the urgently needed living space, but also to create living quarters for living and working. The mistakes of the 70s must not be repeated! Uli Hellweg, responsible for two Berlin development areas on the Spree and Havel rivers for more than a decade, talks at the Munich Environment Academy about the peculiarities, obstacles and pitfalls of urban development law. 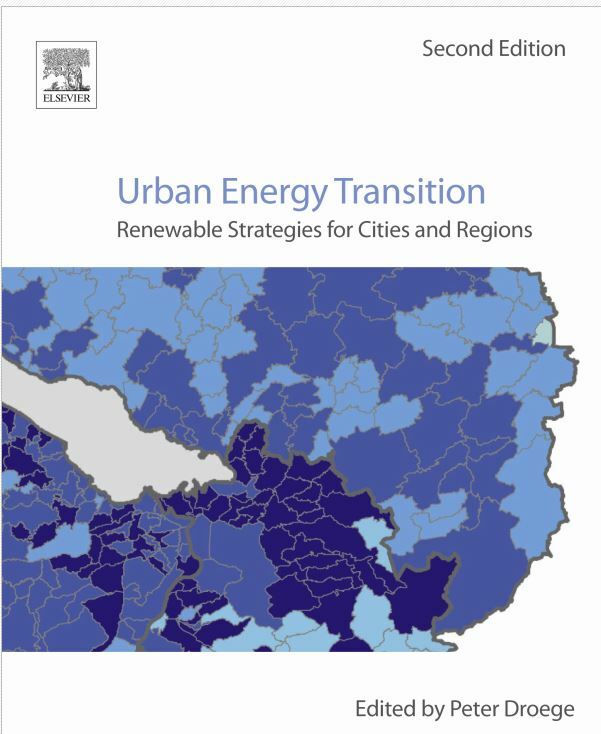 How to Create Urban Innovation? La Fabrique de la Cité invites you to a conference-debate bringing together the main actors of the urban policy of Hamburg. This evening will also be an opportunity to question, beyond the case of Hamburg and in a Franco-German view, the differents ways to create urban innovation nowadays. 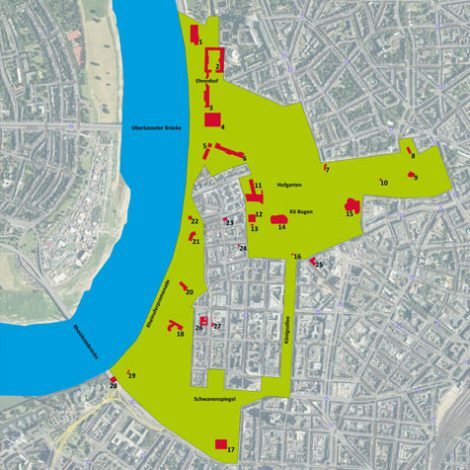 In a unique participation and planning process, the City of Düsseldorf wants to revive the “Green Ring” in Düsseldorf, created by the great landscape planner Maximilian Friedrich Weyhe at the beginning of the 19th century, and develop it into a catalyst for urban planning and open space networking in the city. In the “Blaugrünen Ring”, the numerous art and cultural institutions are to be merged to form a holistic experience and culture mile. 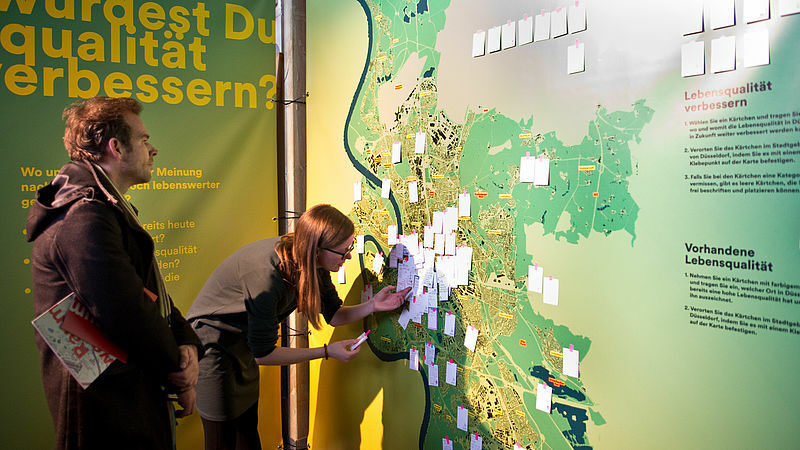 To this end, the City of Düsseldorf has launched an international open space planning, urban development and artistic competition after intensive citizen participation. The task of the competition is to create a link between the art and cultural sites loosely juxtaposed by post-war planning and to merge the testimonies of garden and urban culture into an art and cultural landscape interwoven with the urban space. 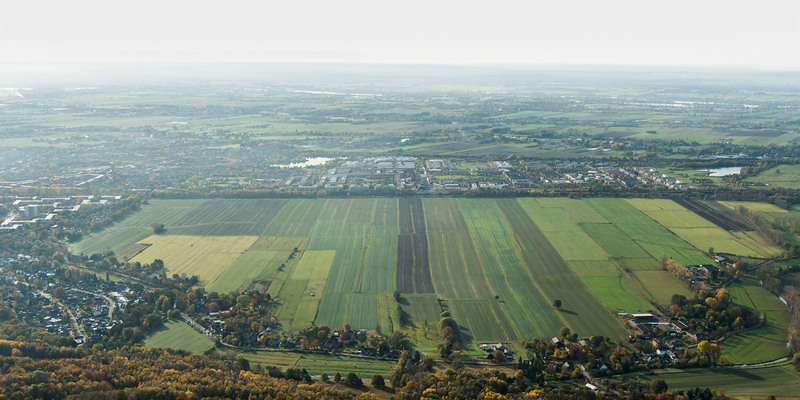 The international, visionary, urban planning, open space planning and artistic competition “Blaugrüner Ring” covers an area of about 158 hectares. 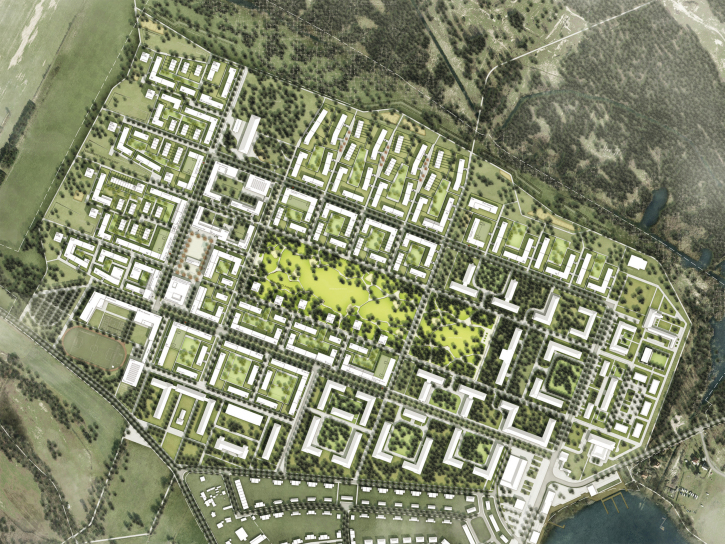 In the first phase, 60 competition participants are working on developing an overall concept for the Blaugrüner Ring. In a second phase, starting in June 2019, approximately 20 interdisciplinary teams will deepen the overall concept and selected subspaces. The processing stages will be supplemented by a public exhibition and discussion of the interim results. A jury of experts will accompany the process and will judge the winners in December 2019. 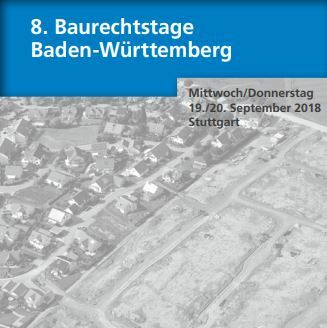 In the article “No WerkbundStadt” Uli Hellweg shows the mechanisms of speculation and political helplessness using the example of the failed model project “WerkbundStadt Berlin”. 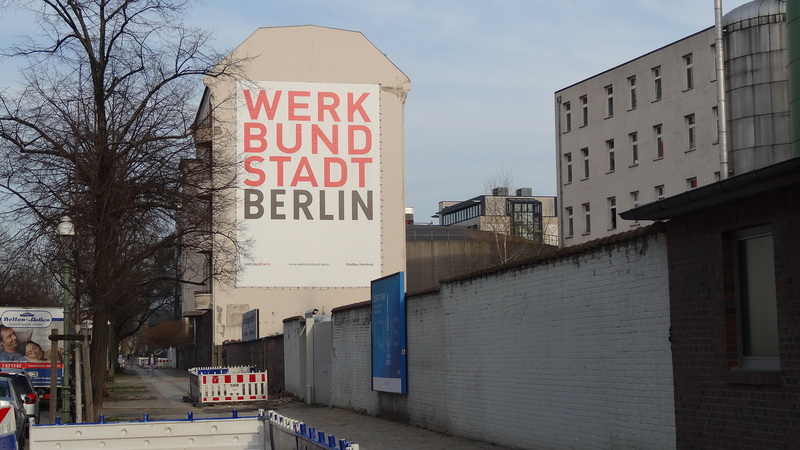 The article led to fierce controversies in the Deutscher Werkbund Berlin, as a result of which Uli Hellweg resigned as Chairman of the Board of the Deutscher Werkbund Berlin. 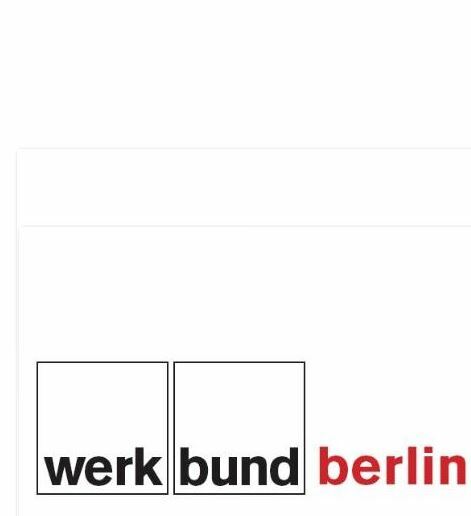 The Executive Board of the Deutscher Werkbund Berlin regrets the cancellation of the model project by the owners. “The new owners are obviously not prepared to comply with the rules of the target agreement, because we demanded no more and no less,” said chairman Uli Hellweg. “The model character of a Werkbund project must also be reflected in the way in which it deals with each other and in the process design,” said Christiane Thalgott, member of the advisory board. 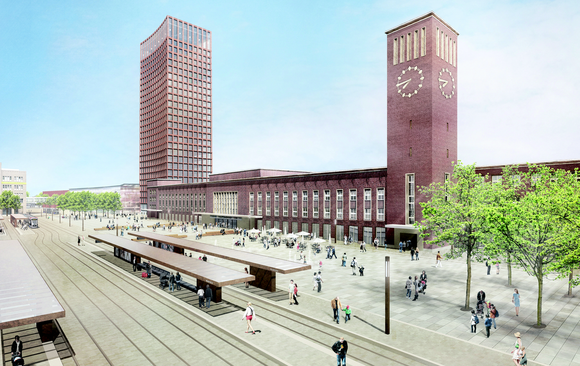 “For the state of Berlin, this calls into question a outstandig urban development project,” continued the former Munich City Councilor. The Bremen House – a model of the future? 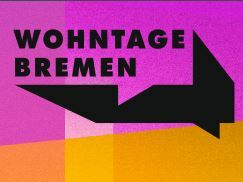 – Panel discussion with Uli Hellweg, Martin Pampus, Dr. Ben Brix and Prof. Katja Pahl. With the Urban Development Plan for Housing, or STEP Wohnen for short, the Free Hanseatic City of Bremen is setting the framework for a new model of “living” from 2021. What traditions and qualities can one rely on? What are the future requirements and goals? What changes do we have to react to in planning and projects? The input of experts is just as important as the ideas and opinions of the citizens. 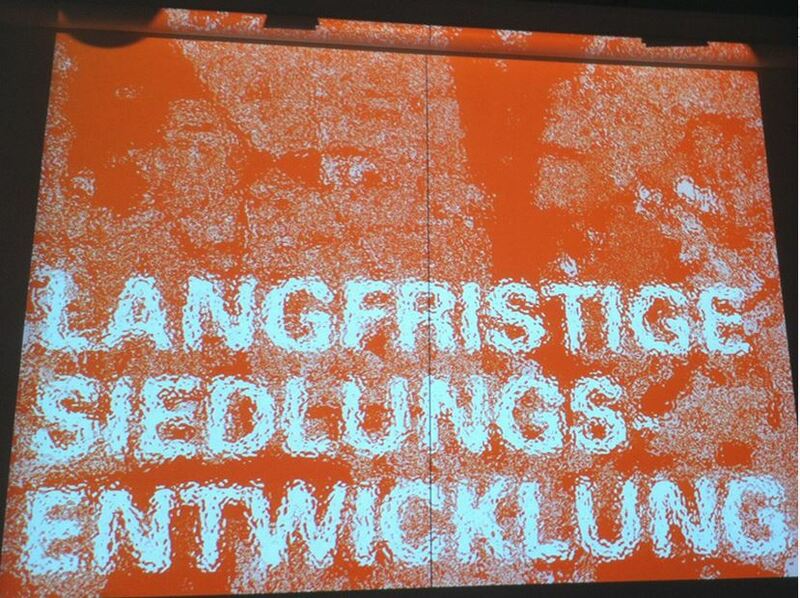 Uli Hellweg will give the keynote speech at the specialist event “Raumwerk D”. 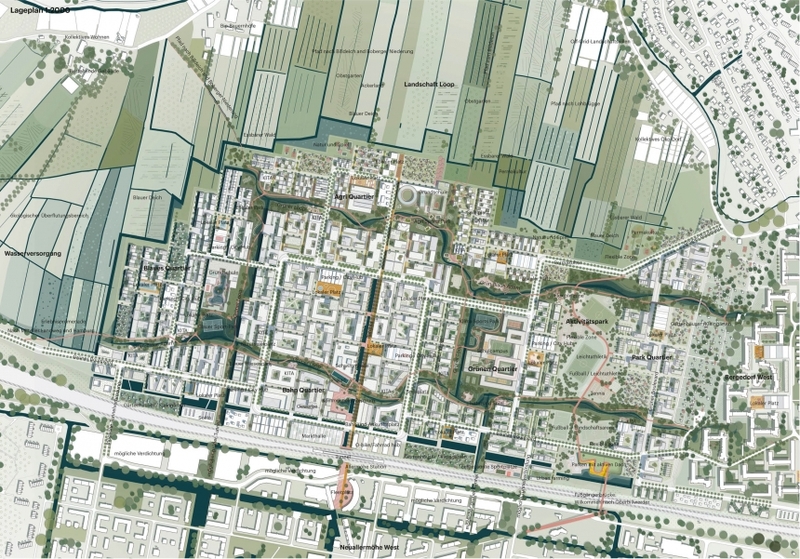 Düsseldorf plans to develop a spatial structure for the city and its subspaces in a broad-based citizen participation process. 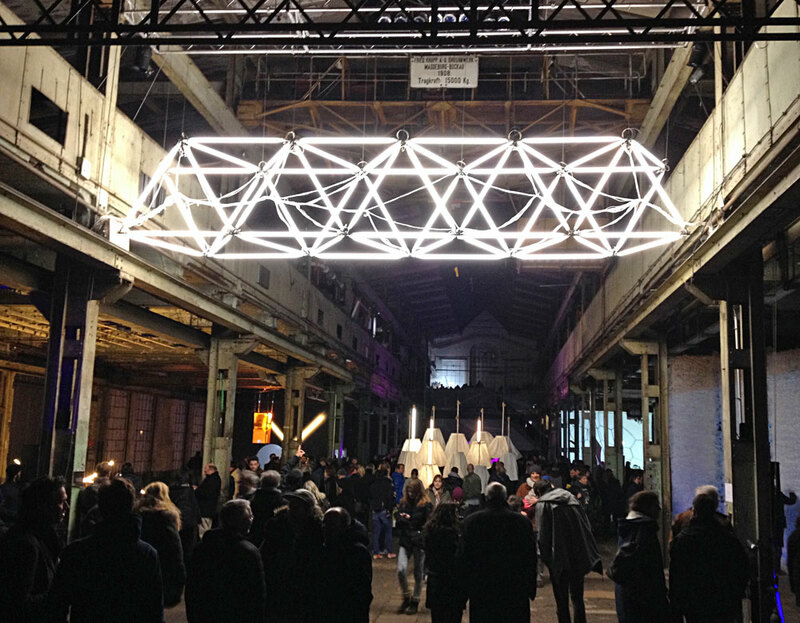 Raumwerk D is intended to develop an urban development concept for Düsseldorf at an urban level in a discursive process with the city society. 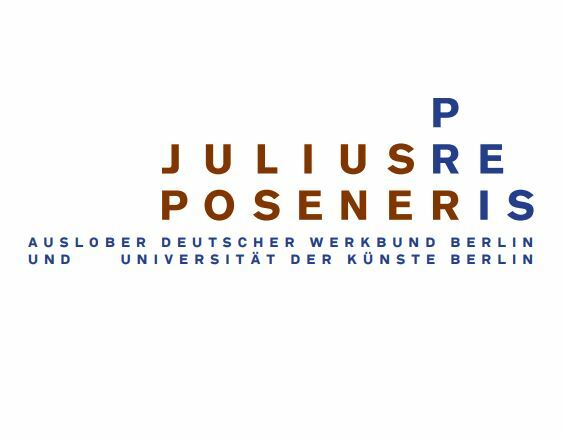 March 16, 2018, Berlin: New Executive Board of Deutscher Werkbund Berlin e.V. 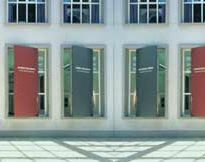 At the general meeting of the Deutscher Werkbund Berlin on 8 March 2018, a new board was elected in accordance with the statutes. The Board of Directors consists now of Uli Hellweg (chairman), urban planner, Stefanie Bürkle (deputy chairman), artist, Harald Bodenschatz, city planner. Frankfurt is growing and growing. More and more people want to live in this city. This increases the pressure on the housing market and leads to a massive increase in rents that more and more people cannot afford far into the middle class. PODIUM DISCUSSION: What are the capabilities of international formats of integrated action and development concepts? Detlef Raphael, Member of the German Association of Cities, Berlin. 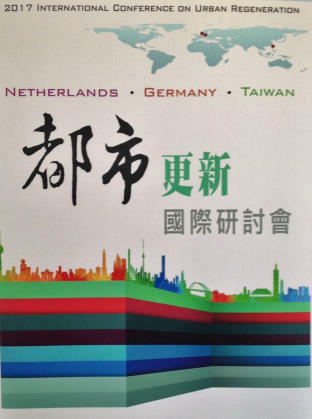 The discussion will focus on the question of whether a cooperation between “European Capital of the Environment”, “European Capital of Culture”, garden shows and international building exhibitions could generate synergy effects between the formats. 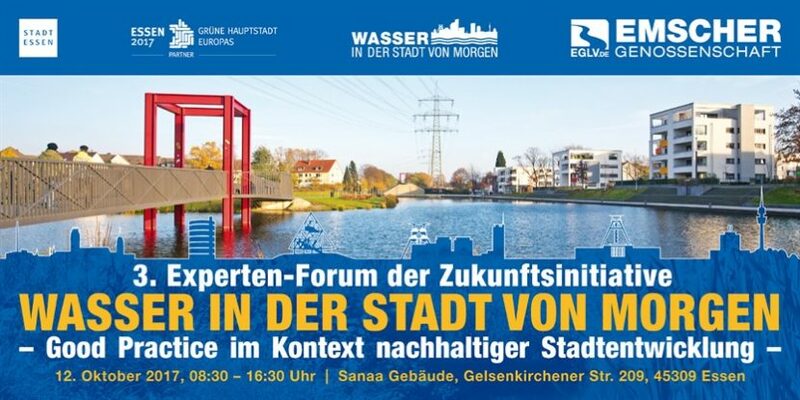 November 30, 2017, Düsseldorf: NRW Symposium 2017 Growth of City and State in Cooperation – Fleeting Affair or New Love? 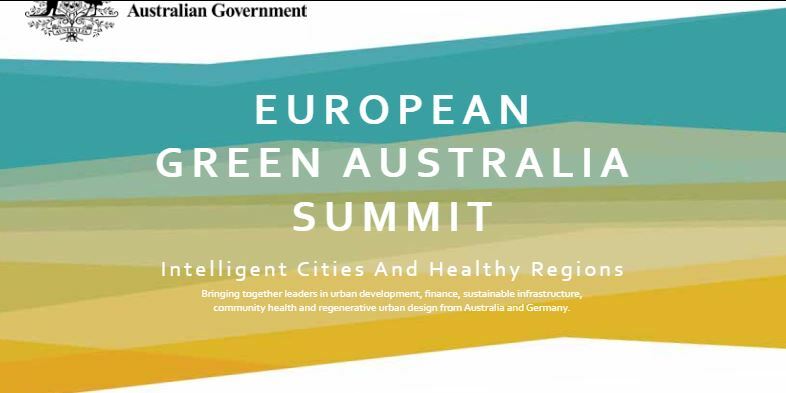 Intelligent Cities and Healthy Regions. Uli Hellweg talks about “International Building Exhibitions” (IBA) as drivers of urban development. Uli Hellweg will give the speech at this year’s graduation ceremony for the 2016/17 graduation year of the Faculty of Architecture and Urbanism. 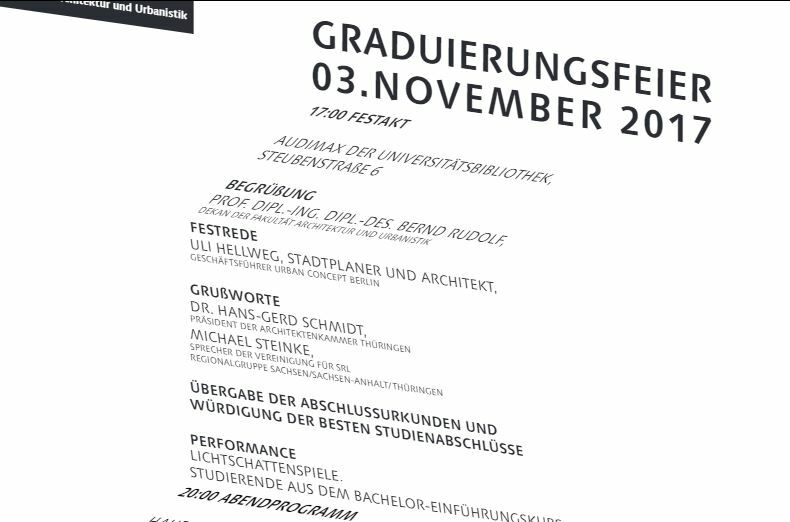 The graduation ceremony on November 3, 2017 marked the graduation of the 2016/2017 academic year at the Faculty of Architecture and Urban Studies at the Bauhaus University Weimar. Traditionally, the best theses have also been honoured at the ceremonial farewell ceremony of the alumni. What distinguishes urban mobility today and which trends need to be kept in mind? How do we move through the city today, how tomorrow? What does this mean for the development of a centrally located inner-city area? These and other questions will be addressed in the first “Hall Talk”. Hall Debate 2: Space and Society Thursday, 28 September 2017, 6 p.m. – 7.00 p.m. – 7.30 p.m. What characterizes urban society today and what developments shape it? Which districts and neighbourhoods tell which city stories? How diverse is the city today – or how similar? 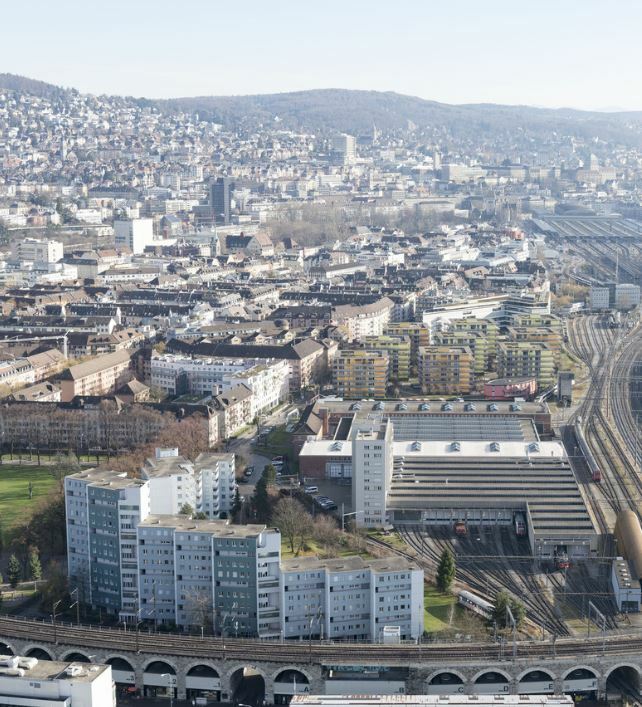 And what does this mean for the development of a centrally located inner-city area such as Neugasse Zürich and for living together in a new district? These and other questions will be discussed in the second hall discussion. 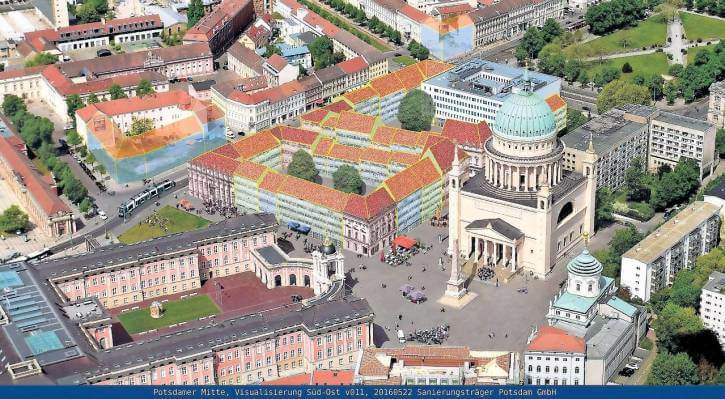 Under the leadership of chairman Uli Hellweg a jury of 14 experts selected 43 candidates for the 2nd stage of the selection process in the heart of Brandenburg Capital Potsdam. 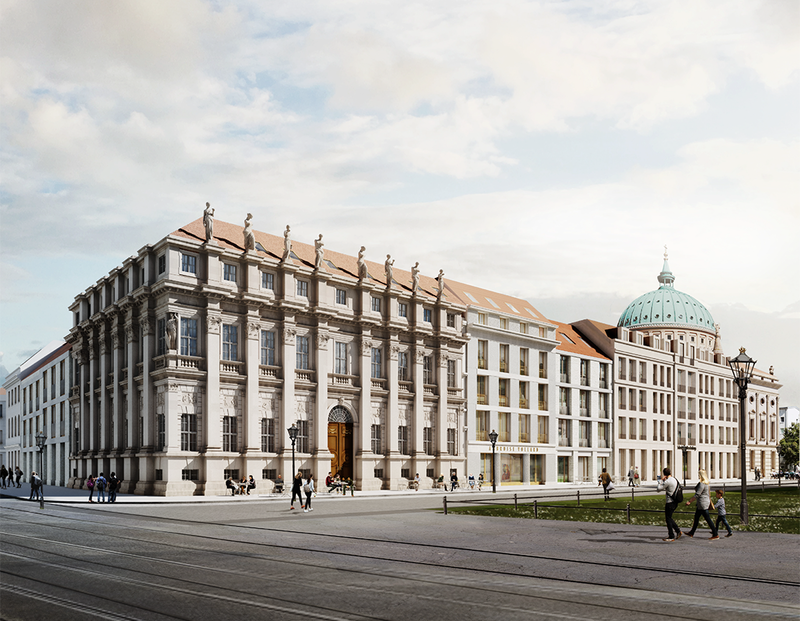 Applicants now have time until fall, to submit proposals for buildings on 9 plots in block III, immediately situated vis-à-vis of the reconstructed Prussian City Palace (site now hosting the Brandenburg federal state parliament), the famous Barbarini Museum and the historic Nicolai Church. The final decision of the jury is expected tob e made in spring 2018.